These sample questions are simple and basic questions that represent likeness to the real EC-Council 312-49 exam questions. To assess your readiness and performance with real time scenario based questions, we suggest you prepare with our Premium EC-Council CHFI Certification Practice Exam. When you solve real time scenario based questions practically, you come across many difficulties that give you an opportunity to improve. 01. Syslog is a client/server protocol standard for forwarding log messages across an IP network. Syslog uses ___________to transfer log messages in a clear text format. 02. What is the First Step required in preparing a computer for forensics investigation? 04. File deletion is a way of removing a file from a computer's file system. What happens when a file is deleted in windows7? 05. BMP (Bitmap) is a standard file format for computers running the Windows operating system. BMP images can range from black and white (1 bit per pixel) up to 24 bit color (16.7 million colors). Each bitmap file contains header, the RGBQUAD array, information header, and image data. Which of the following element specifies the dimensions, compression type, and color format for the bitmap? 06. When collecting evidence from the RAM, where do you look for data? 07. Depending upon the Jurisdictional areas, different laws apply to different incidents. Which of the following law is related to fraud and related activity in connection with computers? 08. LBA (Logical Block Address) addresses data by allotting a ___________to each sector of the hard disk. 09. How do you define Technical Steganography? 10. Which is not a part of environmental conditions of a forensics lab? 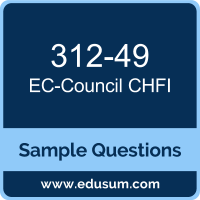 Note: For any error in EC-Council Computer Hacking Forensic Investigator (CHFI) (312-49) certification exam sample questions, please update us by writing an email on feedback@edusum.com.